Guilin is a city in Guangxi Region, China. Guilin is a scenic town and one of the best-known tourist destinations in China. There are many scenic places within short traveling distance of Guilin. These include Longsheng with its famous Longji rice terraces; The Li jiang river, a scene of which is printed on the back of ¥20 bank notes; Yangshuo, a small city downstream form Guilin; and much more. 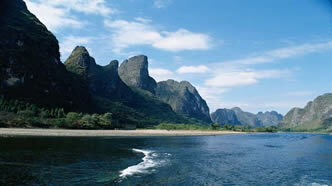 This makes Guilin an excellent base for exploring the northern end of Guangxi region. Guilin is a beautiful city. Guilin has the stunning landscape in which the city is situated has a kind of magic that is all its own. The strangely shaped hills, or karsts, with the verdant vegetation ranging from bamboo to conifers together with wonderful caves make Guilin such an attraction for tourists.GLocated in the northeast of Guangxi Zhuang Autonomous Region, Guilin is considered to be the pearl of China's thriving tourist industry on account of the natural beauty and historic treasures. Covering an area of about 27,800 square kilometers (10,734 square miles), the city is rather compact when compared with other leading cities in the country. However, situated within this area one may find green mountains, crystal clear waters, unique caves and beautiful stones. Major attractions include Elephant Trunk Hill, Li River, Reed Flute Cave and Seven-Star Park that boasts a Stone Museum where amazing geological finds are displayed. Believe that each of these places and many other attractions will leave you the lasting memories. This park on the banks of the Li River contains a hill with a large natural arch cut into it. This resembles the trunk of an Elephant dipping into the river. This scene is frequently used as a symbol of the city and so has developed some fame. This limestone cave with impressive stalactite and stalagmite formations is worth a visit. An English-speaking guide will take you around the various artificially lit formations supposedly resembling lions, monkeys, old men, the skyline of Guilin, etc. You may have to wait a while for a large enough group to accumulate. Avoid the hawkers by taking the elevated path on the side of the hill, rather than the tarmac road. A park in the northeast of the City on the banks of the Li River. The park contains historical stone carvings and Buddhist inscriptions. Fubo Hill itself is an impressive shear sided rock. This is a large country park which encompasses the highest peak in the area. Foot paths run to the summit, however the chair lift provides an effortless way to attain the top and enjoy the scenery. There are extensive views of the surrounding area from the sumit. There is a toboggan run down part of the mountain. To access this, dismount the chairlift at the station half way down the mountain. In the center of the city lies a small forbidden city. Once home to the Princes of the area. The palace buildings are now a museum and park. One of the largest aquariums in Asia. This modern facility has a wide range of fish and other aquatic animals. Longji Terraced Fields is in the Heping town in Longsheng, a 2 hours drive from Guilin. The terraced rice fields, like ladders, wind from the bottom of the mountain to the top. The elevation varies from 380 meters to 880 meters with a drop of 500 meters. First built during the Yuan Dynasty, these rice fields were built with the determination, sweat and blood of generations of people. It is a testimony to the ingenuity of agriculture in mountainous areas. These fields are often belt-shaped, narrow and long, most of which are only wide enough for two rows of crops. The largest patch is only one Mu. There are about 66 square kilometers of terraced fields in southeast Longsheng. Bamboo Carving,Lapidarist Painting,Paper Umbrellas,Landscape Painting,Painted fans,Sanjin Watermelon Extract. Lunar New Year,Lantern Festival ,Dragon Boat Festival,Mid-Autumn Festival .